SOUTH BEND, Ind. (CNS) — With public confidence in government “at historic lows” and cynicism “high,” the University of Notre Dame will present its 2016 Laetare Medal to two public servants known for “their leadership, civility and dedication to our nation,” the university’s president announced. Vice President Joe Biden and former Speaker of the House John Boehner — two Catholic officials from opposing political parties — will be this year’s recipients of the medal. They will be honored May 15 during Notre Dame’s 171st commencement ceremony. “We live in a toxic political environment where poisonous invective and partisan gamesmanship pass for political leadership,” said Holy Cross Father John I. Jenkins, Notre Dame’s president. “Public confidence in government is at historic lows, and cynicism is high. “It is a good time to remind ourselves what lives dedicated to genuine public service in politics look like. 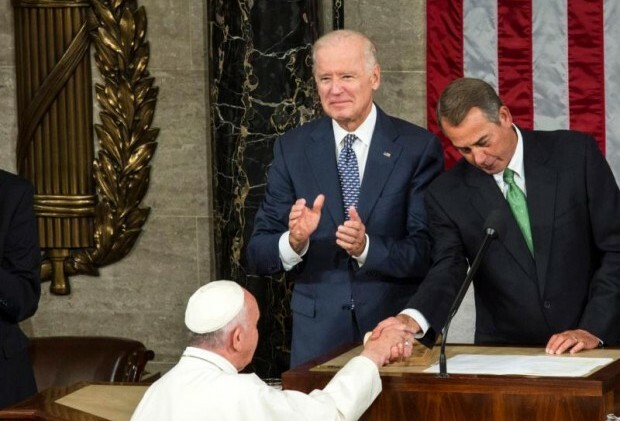 We find it in the lives of Vice President Biden and Speaker Boehner,” the priest said. The honor is so named because its recipient is announced each year in celebration of Laetare Sunday, the fourth Sunday in Lent, which this year was March 6. “Laetare,” the Latin word for “rejoice,” is the first word in the entrance antiphon of the Mass that Sunday, which ritually anticipates the celebration of Easter. The medal bears the Latin inscription, “Magna est veritas et prevalebit” (“Truth is mighty, and it shall prevail”). While both Biden, a Democrat, and Boehner, a Republican, “have been loyal and committed partisans, they were leaders who put the good of the nation ahead of partisan victory, seeking through respectful dialogue honorable compromise and progress,” Father Jenkins said in his statement. “Boehner’s resistance to a simple reductionism made him suspect in his own party; Vice President Biden reminded his fellow Democrats that those in the other party are ‘our opponents, not our enemies,'” the priest added. Before his election as vice president in 2008, Biden represented Delaware in the U.S. Senate for 36 years. At age 29, he became one of the youngest people ever elected to the U.S. Senate. Soon after his election, his wife and infant child were tragically killed in an automobile accident, yet he persevered in caring for his family as a single parent and in serving in the Senate. He commuted between his home in Delaware and Washington for many years. In the Senate, Biden served as chairman or ranking member of the Judiciary Committee for 17 years and played an integral role in the 1994 Crime Law and the Violence Against Women Act. He also served for 12 years as chair or ranking member of the Senate Foreign Relations Committee, helping to guide issues and legislation related to terrorism, weapons of mass destruction, post-Cold War Europe, the Middle East and Southwest Asia. Born in Scranton, Pennsylvania, Biden earned his bachelor’s degree from the University of Delaware and his law degree from Syracuse University College of Law. Boehner became Speaker of the House in January 2011 and was re-elected in January 2013 and January 2015. He stepped down from the post and resigned from Congress last fall. He was first elected to the U.S. House in 1990, serving the 8th Congressional District of Ohio, and was re-elected 10 times. Among House Republicans, Boehner served as conference chairman, minority leader and majority leader. He also served as chairman of the House Education and Workforce Committee where he was the author of several reforms, including the Pension Protection Act and a school-choice voucher program for low-income children in Washington. Growing up in southwest Ohio, the second of 12 children, he was raised in a family of modest means. After graduating from Jesuit-run Xavier University in Cincinnati, he worked in business and served in the Ohio Legislature. Among the previous recipients of the Laetare Medal are Civil War Gen. William Rosecrans, operatic tenor John McCormack, President John F. Kennedy, Catholic Worker co-founder Dorothy Day, novelist Walker Percy, Chicago Cardinal Joseph Bernardin, labor activist Msgr. George G. Higgins, House Speaker Tip O’Neil, actor Martin Sheen and jazz composer Dave Brubeck. Retired U.S. Army Gen. Martin Dempsey, chairman of the Joint Chiefs of Staff from 2011 to 2015, will deliver the principal commencement address and receive an honorary degree at the May ceremony. Others scheduled to receive honorary degree include are civil rights activist Diane Nash, musician Arturo Sandoval and Washington Cardinal Donald W. Wuerl. In the posting to date, I hear a lot of anger, fear and judgment of others, and a bitter criticism for a lack of Catholic leadership on the part of Notre Dame University, and in the case of one posting even of the American Catholic hierarchy. I offer the following consolation sincerely in the spirit of Christian fraternal charity. There is nothing to fear, don’t feel threatened, and focus on the message of Easter: Christ has risen! The world is not locked in a battle between the Children of Light and the Children of Darkness. That is Manichaeism, which since the Third Century A.D. the Catholic Church has consistently labeled as a heresy. Vice President Joseph Biden vs. John Boehner, Democrats vs. Republicans, Conservatives vs. Progressives, ISIS vs. the West, it’s all irrelevant to Salvation History. Through his suffering on the cross, Christ won an irreversible victory. We live in a redeemed world. The Kingdom of God commenced on Easter Day. With the help of the Holy Spirit, our challenge is to spread this Good News and to live the Kingdom, which is incompatible with anger, fear and judgment. For normal people this article would have been considered a lampoon but not for the progressives. Boehner was nothing more that a tool of the Republican establishment whose biggest claim to fame would have been his deceit of the conservatives who got him elected. Biden , at best, would be considered a political buffoon who, when he spoke, usually put his foot in his mouth. But, from a Catholic perspective, Biden’s biggest fault would be his enthusiastic support of abortion and gay marriage. Biden has been a favorite of Catholic Philly.com; just three months ago there was another article praising him as the poster child of fatherhood. Publications of such stories are the hierarchy’s way of tacitly saying to its congregation-“Vote Democrat.” Remember, the hierarchy of the Church has adopted the platform of the Democratic Party: Immigration, abortion, Homosexuality the environment, and the ban on capital punishment. This support will guarantee funding of the Church’s/Democratic Party’s social engineering projects and will also gain favor from the secular world. It must be great to be popular. How can a Catholic remain in communion with Christ and His One, Holy, Catholic, and Apostolic Church, if they deny the Sanctity of human life from the moment of conception, and the Sanctity of marriage and the family as God intended? These are not policy positions, but that which a Catholic must believe with Divine and Catholic Faith. How can you present the Laetare Medal in good Faith if you need to justify it by a disclaimer that the University of Notre Dame does not support the policies of either party including the pro-life, and pro marriage policies of what one recepient refers to as the opposing party? How does lack of respect for the Sanctity of human life, and the Sanctity of marriage and the family, promote the common good or help build bridges? I suggest they consider Biden’s attacks on Justice Thomas when Jenkins cites keeping opening dialogue or his statement that Republicans want to put African-Americans back in chains ( I must have missed all those Republican slave owners ). Does not Notre Dame translate from the French to Our Lady in English? I wonder how she must feel about an award given to a blatant pro-choice individual, who tried to defame an innocent man ( called him a drunk in the accident that unfortunately killed his first wife and child, which was totally false ). Maybe he can buy us all coffee at 7-11. This is not a story. ND has not been Catholic for years. ND is one of the most hostile places toward the church. Biden supports killing unborn children…is that the new ideal of the Church? Shameful as usual.